The below Niseko map offers a bit of inspiration for ski holiday to Japan. Home to 5 different ski resorts the Niseko trail map below allows you to familiarise yourself with the location of some of the most popular ski fields including Hirafu, Higashiyama, Annupuri and Hanazono. 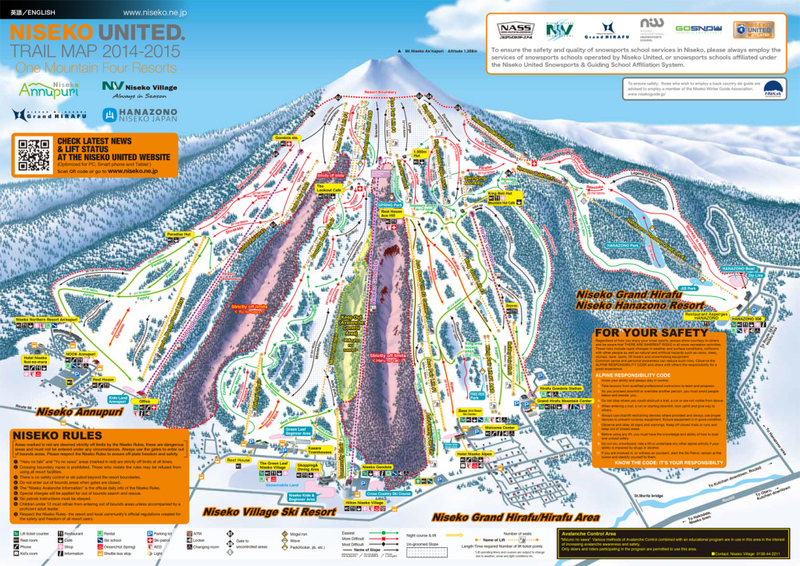 As the map shows, Niseko village is the most centrally located ski resort and offers easy access to the majority of the other ski resorts via a free shuttle bus service. Showing everything from the off limits areas and various ski lifts to the most popular ski runs, this Niseko map is a handy resource for planning your skiing holiday. A great way to get to know the layout of Niseko, this trail map is designed to save you time when you arrive, allowing you to identify the runs most suited to your level of experience. From easy terrain for beginners through to slopes that will challenge even the most experienced of skiers, this Niseko map has it all. From mogul runs to waves, half pipes, kickers and jibs, there are a number of runs to suit your skiing style. This Niseko map also shows the variety of facilities dotted around the mountain including lift ticket counters, cafes and restaurants, ski school, gear rental and even the onsen hot springs.